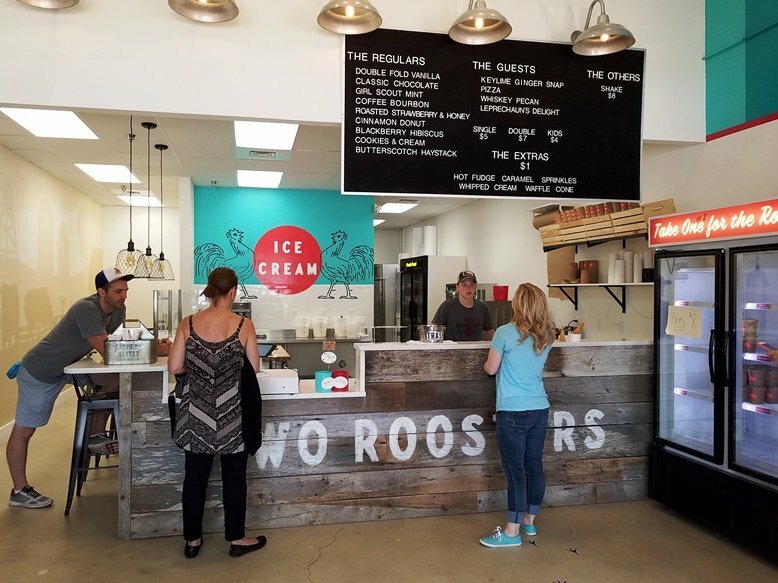 First Take: The Inside Scoop, Two Roosters is Dishing Out Great Ice Cream in Raleigh! 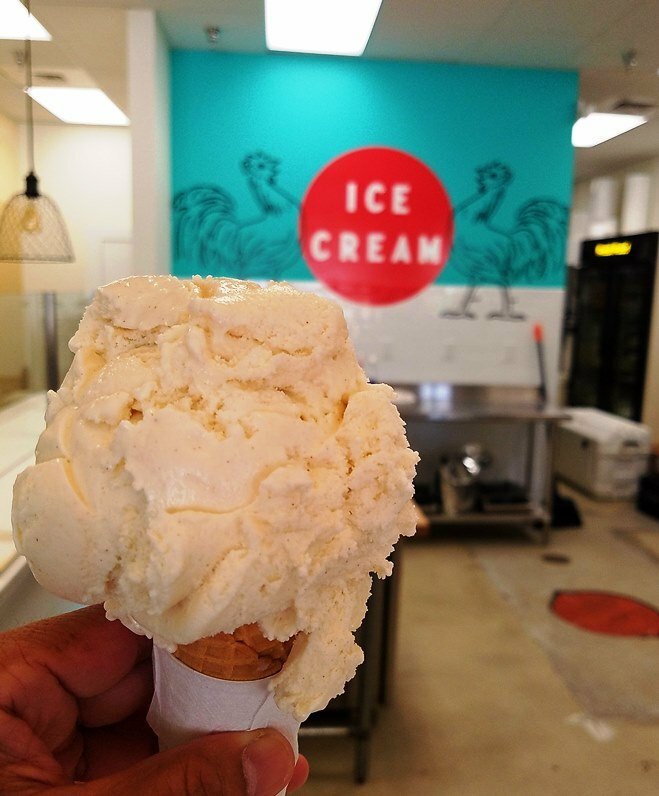 If you’re a fan of creamy, sweet ice cream have I got a hidden gem for you: Two Roosters in N. Raleigh! Located in Greystone Village off of Lead Mine Road, Two Roosters was known for their brightly colored trailer and doling out delicious ice cream. Thankfully they were able to make the leap to bricks and mortar and to a permanent storefront so you don’t have to chase them around again! It’s a busy strip plaza and Two Roosters is hidden a bit in a corner, just look for the Bottle Rev 3 sign and to the right. The small store-front opens up into a bright and light space with high ceilings! It’s a simple space with a handful of small marble-topped tables, refrigerated case and large black and white sign overhead with press-on letters (important, the menu!) 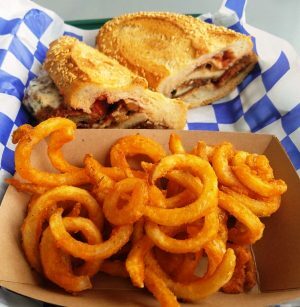 Two Roosters does 8 or so regular flavors and gets a little crazy and creative with seasonal flavors. 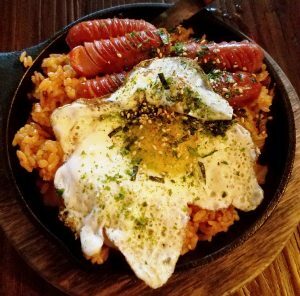 I’ve seen everything from pizza to roasted black sesame to sriracha and fortune cookie, very cool! 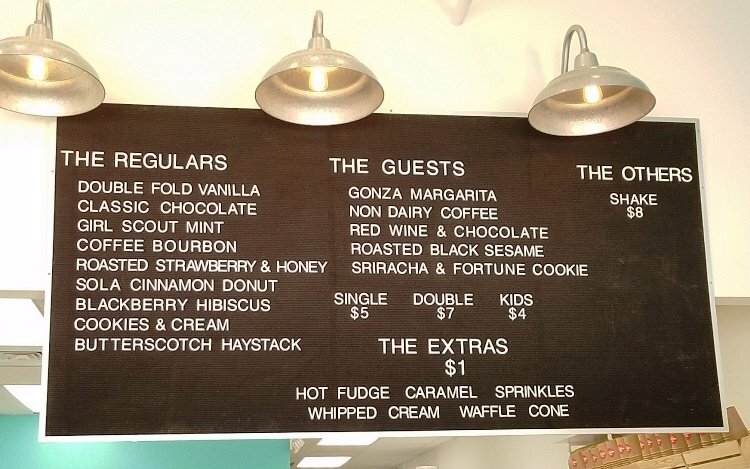 Scoops run from $4 to $7 (cup or cone) and they offer up a handful of extras like hot fudge, sprinkles, whipped cream and more. For ice cream, I tend to stick to the basics. It’s a rare treat for me since I’m a bit lactose-intolerant but I squeeze in a cone every now and then. 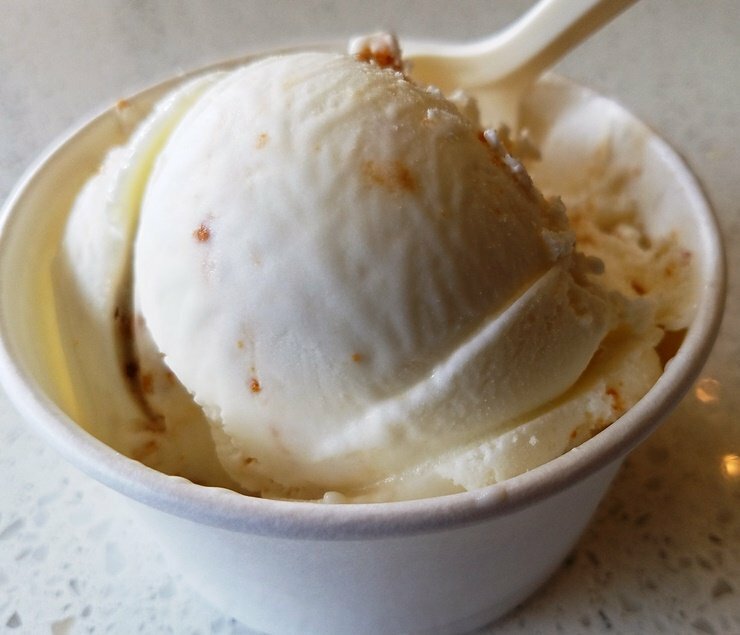 I’ve tried out both their butterscotch haystack and Sola cinnamon donut in cup and cone form. They do a really nice job with their ice cream and balancing flavors. The butterscotch haystack is speckled with crunchy bits which are nicely blended in. And the Sola cinnamon donut?! Wonderfully light with just the right amount of sugar and cinnamon to amp up your taste-buds. Two Roosters is definitely scooping out some great ice cream on par with say, Parlour out in Durham. 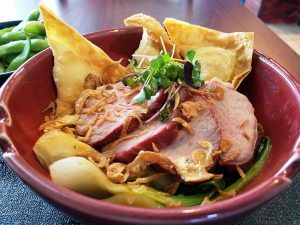 Portion size is about right and service is friendly so sample away! The space is basic compared to Parlour but who cares when the ice cream is so good? And while the seating is somewhat limited inside, there’s also plenty of plaza patio space outside. 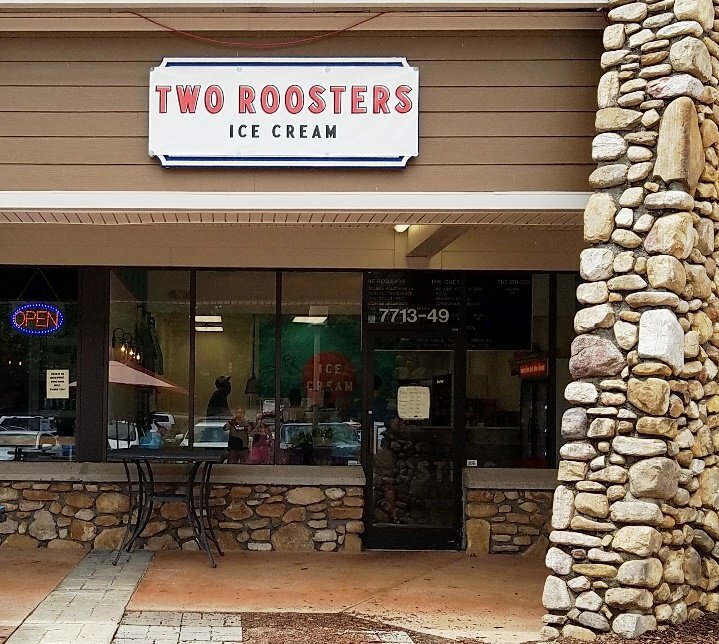 So glad you were able to open a storefront Two Roosters and I’ll make the longish trek out to N. Raleigh just to have more of your delicious cream, congrats!